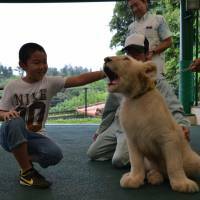 Tokyo’s Ueno Zoological Gardens may have the giant panda cub Xiang Xiang to adore, but a zoo in Okinawa has its own critters to be crazy about: lions. As of Dec. 24, visitors to Okinawa Zoo & Museum in fiscal 2017, which started in April, totaled 355,932, marking a record high since the park’s renovation over a decade ago. The zoo has attributed the rise in visitors to the popularity of two lions, particularly a 14-month-old white male cub named Seramu. Thanks to the presence of Seramu and Arusha, another male lion, visitor numbers rose by 25,043 from the previous record of 330,889 posted during the same period in fiscal 2015. 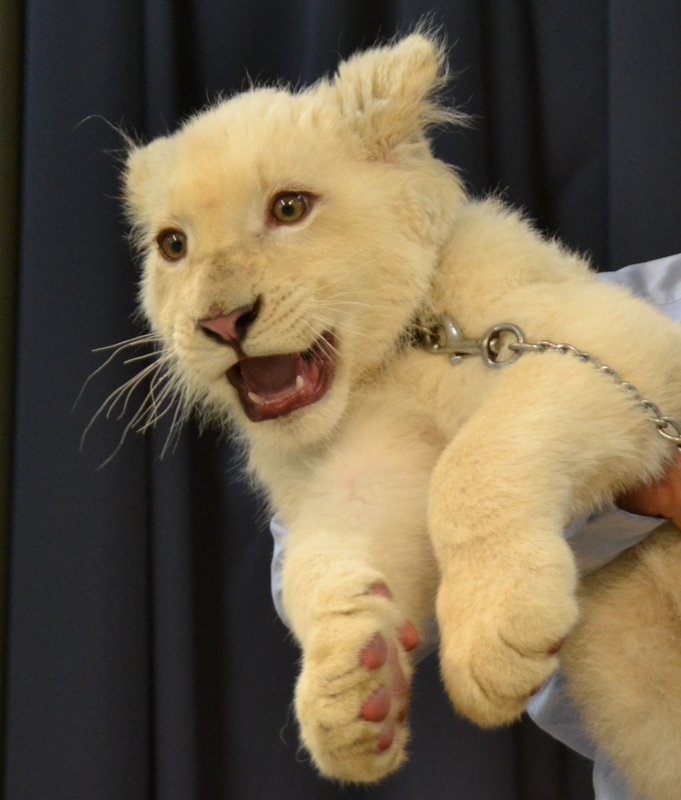 The white lion cub was given to the zoo by Tohoku Safari Park in Fukushima Prefecture last March. When it was moved to Okinawa, it drew public attention for being the first zoo in the Kyushu and Okinawa area with a white lion. Born in November 2016, the male cub initially weighed 1,300 grams and was 18 cm long. The white lion has since grown to weigh about 100 kg and measure 120 cm long. Its mane has also started to grow. Arusha, meanwhile, joined the Okinawa zoo last January. It came from the Tama Zoological Park in Tokyo. In a popularity vote conducted online and via ballot boxes set up in the zoo between Sept. 4 and Sept. 24, Seramu came in first, garnering 212 of the 1,466 total votes, followed by Fukuta, a Tsushima leopard that got 185 votes. And with Arusha coming in third with 167 votes, the rankings showed the dominance of the feline species. “Okinawa may have been influenced by the recent cat boom,” said Kozue Ogimi, a zoo official. Seramu was born in Tohoku Safari Park on Nov. 14, 2016, when the supermoon appeared. Its name was taken from “Pretty Guardian Sailor Moon,” a popular Japanese animation series. 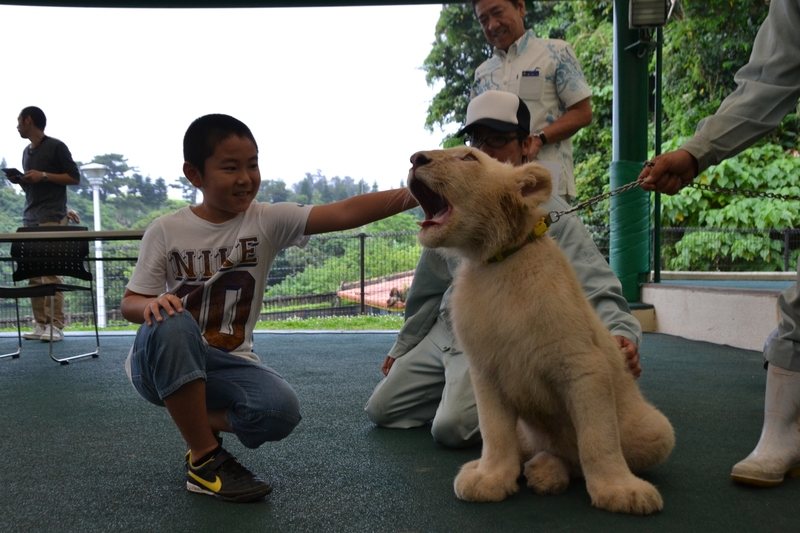 The white lion cub was named by Kota Suetake, then a 9-year-old fourth-grader at Takahara Elementary School in the city of Okinawa, when his suggestion was selected in June out of 4,850 entries submitted. Suetake’s name choice was one of the five final candidates. 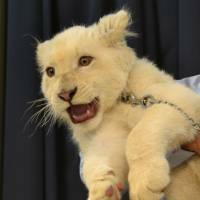 He was among those invited to a naming ceremony in June where the white lion circled plastic balls bearing different names. The little feline eventually chose the name Seramu. “I want it to grow and be healthy,” Suetake said. Riding on the popularity of the white lion, the Okinawa branch of Japan Post presented the zoo and the Okinawa Municipal Government last month with original postage stamps bearing the images of the zoo’s 10 animals, including Seramu. Satoshi Kaneshima, postmaster of the Awase Postal Office, said in a presentation ceremony that the stamps were created to help revitalize the local economy. Okinawa Mayor Sachio Kuwae also said he hopes the stamps will encourage the public to appreciate the zoo more. This section features topics and issues from Okinawa covered by The Okinawa Times, a major daily in the prefecture. The original article was published on Dec. 26.